Pack size: 1 x 40ml bottle. You might have come across this market leading lens cleaner under the name "Crystal Cleaner". 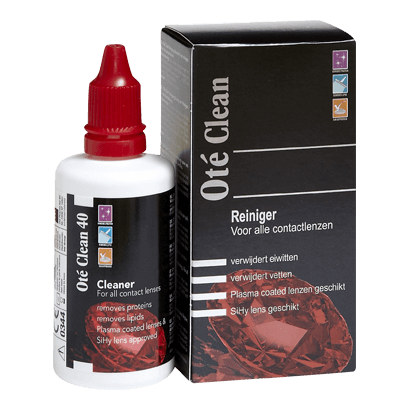 The superb formula has not changed, and Oté Clean continues to provide fantastic cleaning power for hard and soft lenses alike. Produced by the firm No. 7 Contact Lenses, this cleaning solution is a simple and popular way to remove dirt and debris from most common lenses, so do your lenses a favour and buy a bottle to ensure excellent vision. • Oté Clean uses a safe chemical formula which includes ordinary alcohol and non-ionic compounds. These compounds react with dirt from proteins or fats, as well as dust which accumulates on everyone's contact lenses. • It is recommended that, for best results, lens wearers use Oté Clean once every day, to ensure that their lenses feel as good as new every time they place them in their eyes. • Includes the preservative Polyhexanide Biguanide for comprehensive cleaning action. • This cleaner is provided in a handy, easy to store and transport 40 ml bottle. Lens cleaning can be a troublesome business so it makes sense to go with a cleaning product that is tried and tested. With years of popularity and a highly effective formula, Oté Clean is just such a product. So for crystal clear lenses, this is the product for you.